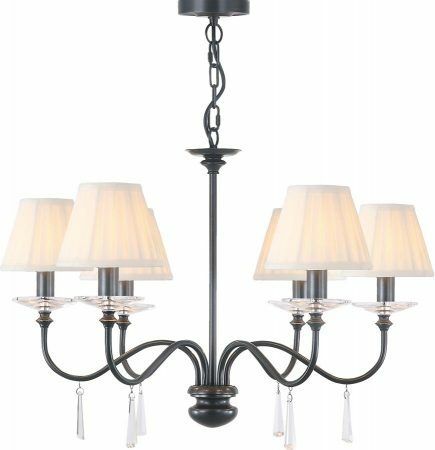 The Elstead Finsbury Park six-light chandelier finished in old bronze, a stunning traditional chandelier, with graceful upswept curved arms. Heavy cut clear glass sconces, hand cut glass drops and matching candle tubes complete this classic light fitting. Shown here with optional cream cotton pleated clip-on lamp shade (LS162) that can be found by following this link. This is a dual mount chandelier that can be hung by the height adjustable suspension chain or fitted as a semi-flush for rooms with limited ceiling height. Please see the technical information below for minimum and maximum height.